Welcome back to our Optimization Deconstructed Blog series! This week we will dive into the fundamentals of optimization by examining the role of an experience audit, the importance of using KPIs, and tools to measure success. An experience audit is the first step we take to evaluate the performance and positioning of a company. It starts with understanding two main things: the target audience and the business itself. Understanding the target audience is critical to evaluating who we aim to reach during our optimization efforts. We must understand what motivates them, how they perceive the brand, and what they expect from a digital experience in order best address their needs and wants. We develop personas to represent a group of users, usually ideal target customers, to develop a deeper understanding of their needs. By learning their expectations for an experience, we can craft a new digital journey that caters to these users. The second aspect of an experience audit involves understanding and examining the role of the business. In order to create an experience that fits the needs and goals of the business, we must understand their brand. This requires a thoughtful knowledge of the brand’s messaging, perspective, and value proposition. Once a thorough and well-rounded cognizance of these two elements has been established, we examine the current experience being offered. When examining the current experience, we also look at a transactional perspective around usability: How easily can users navigate the site and find what they’re looking for? What is the information hierarchy? These questions, among others, inform our approach moving forward. Another fundamental and preliminary step we take when working with a new client is the analytics audit. We typically break analytics audits into two categories: behavioral analysis and technical implementation analysis. While we are performing a behavioral analysis, we identify opportunities to collect more meaningful and actionable data that will allow us to better understand unique audiences and optimize site performance. An audit of a Google Analytics implementation and data output are used to determine data quality and integrity based on best practice standards. We focus on a specific digital property and the corresponding data collected for that digital property, typically focusing Google Analytics and/or Google Tag Manager. We triage how the analytics are implemented on site, event tracking and any customization of the analytics implementation specific to the account. We then evaluate the data integrity as it lives within the reporting tool. Our analytics audit verifies that the data being recorded and used by an organization can be relied on. It also informs our user experience audits, as we can utilize the behavioral analytics to bolster recommendations around user pathing, high value content, and segment-specific analysis on different user profiles. Organizations depend on an analytics implementation that provides valid data. It is the backbone upon which they build their marketing plans and calculate their return on investment. Without verified data in their analytics, organizations may be making business decisions based on incorrect assumptions and projections. Additionally, the use of analytics has an impact on website optimization and improving the overarching customer experience. The technical implementation audit gives businesses the peace of mind that they are collecting data they can trust. We utilize the behavioral analytics moving forward to inform UX and visual design, marketing strategies, and personalization efforts. In some cases, as with our engagement with Specialized, we’re able to use non-digital analogies to help reveal where an experience is falling short. For example, in a brick-and-mortar scenario, what does the shopper want their experience to offer? What additional resources are necessary to fulfill these wants? By taking these aspects into consideration, we can then draw from best-practices in the digital space, and create an intuitive experience based on what users are already familiar with. We use the experience audit as an opportunity to look through a heuristic lens to set a baseline experience, and make incremental improvements from that baseline. In order to craft better brand experiences, we identify the Key Performance Indicators (KPIs) we aim to measure. Measurable success metrics are critical to the success of any optimization effort. Tracking progress and results along a given track gives us the opportunity to not only see what’s working (and to what degree) but also to implement our wins. KPIs also allow us to utilize analytics to discover details about how customers are using the site and where they are spending their time. This allows our analytics team determine which aspects of the website are achieving success and which areas need improvement. This provides us with a strong jumping-off point for figuring out what obstacles exist in the user’s overall experience. This data leads to the further development of strategy towards optimization efforts. Throughout our analytics and testing process, we use best-in-class tools for running tests and measuring the success of our optimization strategy. Some tools we use include Optimizely, VWO, Google Optimize, User Testing, and others. Optimizely is the foremost tool we use because of its ability to run testing on high-traffic websites. It also includes one of the industry’s best personalization platforms. VWO is similar to Optimizely, but is more economical for lower-traffic websites. Google Optimize requires an existing Google Analytics account, and therefore works best for organizations that rely heavily on GA already. This platform provides businesses similar functionality to VWO in terms of A/B testing. Upgrading from the free version to Google Optimize 360 unlocks the ability to import audiences from GA, which allows organizations to better utilize their site data for personalization efforts. User Testing serves experiences to users who are screened to match determined user personas. Their experience is recorded, and we are then able to see how they engage with the site, hearing feedback about their experience. Hot Jar is CRO tool, self-described as “a new and easy way to truly understand your web and mobile site visitors.” The platform offers heatmaps, playback, conversion funnels, form analytics, feedback polls, surveys and user testing recruitment. Crazy Egg is an analytics and visualization tool that shows how users are spending time on a website. They provide “heatmaps” that illustrate where users and clicking and scrolling, and provide user data about where people are coming from and who’s clicking on what with which frequency. Originally set up as a heatmap specialist, Crazy Egg now offers user recordings to let you see how visitors are interacting with your website, as well as viewing snapshots of activity. We always use data to drive our design enhancements and the development of our tests. In order to produce enough data to achieve test results that are statistically significant, high traffic levels are extremely helpful. With higher levels of traffic, we are able to produce results more quickly, which ultimately opens up bandwidth to run more tests. The more people who engage with the tests, the more informative the results. Tests are still possible with lower traffic rates, with extended timelines, through platforms like Optimizely, VWO and Google Optimize. 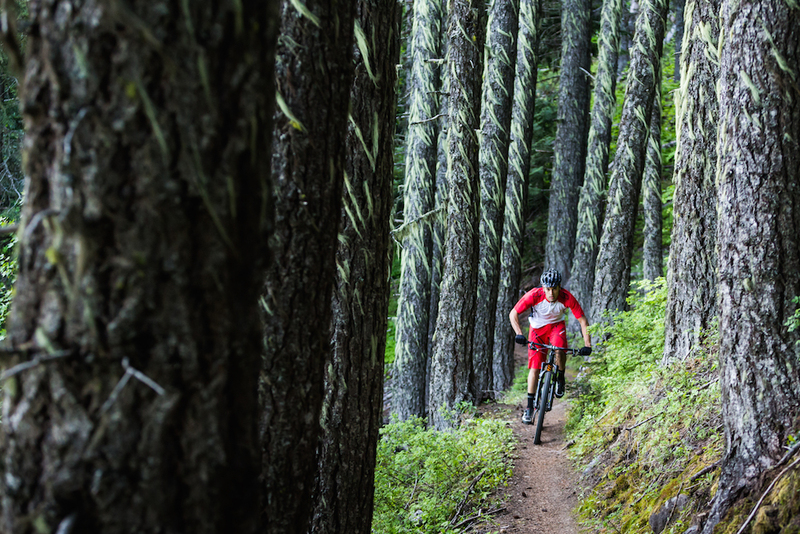 Venturing back to our work with Specialized Bikes, we are going to examine the role our experience audit played in our optimization efforts and development of our strategy. Our experience audit was a fundamental process that informed our approach to optimizing Specialized’s website. An essential part of the audit was understanding Specialized’s customers, and, in this case, we created six different personas to capture the characteristics of their different users. We then realized that a major issue with the site was its inability to register with users as a ecommerce site. Its design and functionality was too closely aligned with their product catalog and telling the brand’s story, which resulted in customer confusion. 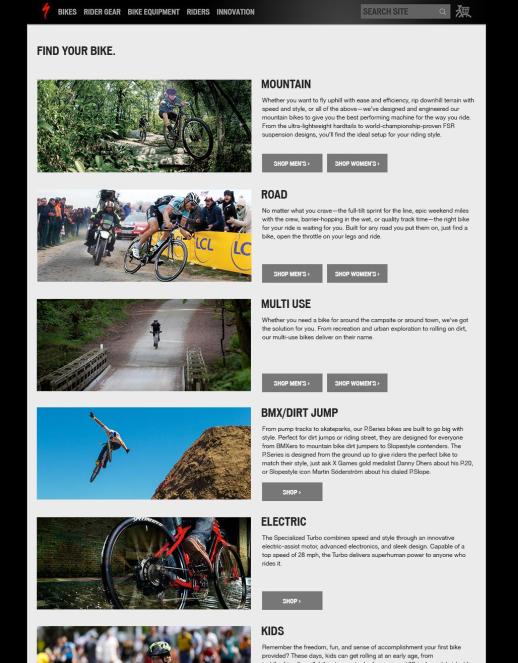 Instead of a large product presence and strong contextual navigation, the site was filled with information about their technology, innovation, and sponsored riders. The oversaturation of lifestyle imagery and content confused customers who often failed to recognize that they could actually shop on the site. After examining these issues, we decided to focus the strategy moving forward on optimizing purchase flow to generate additional revenue and improve website usability. 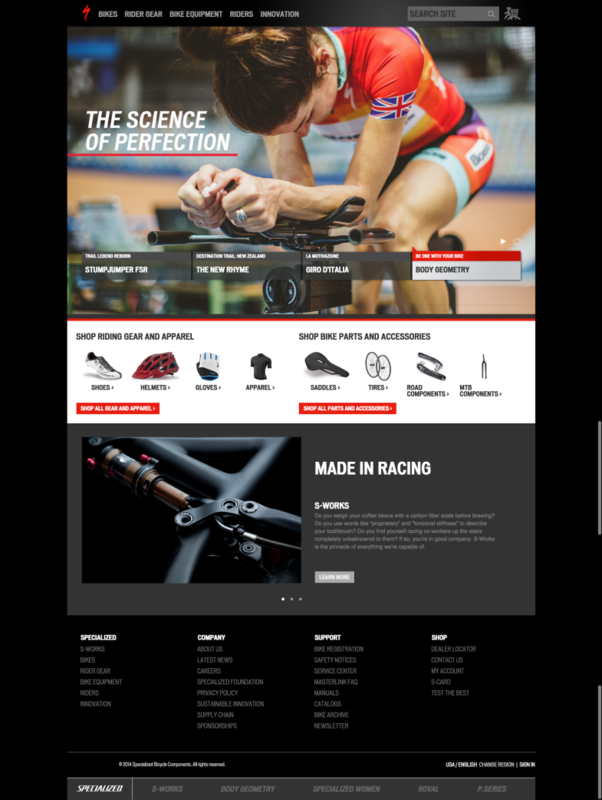 We created specific product categories for the gear being sold on the Specialized site, and did a strategic redesign of the company’s shopping cart icon (check out Part III: Elements of Testing for more on this!). With the introduction of these elements, users easily recognized that they could shop on the site, which resulted in more revenue. Did you enjoy learning about our Optimization process? Keep an eye out next week for Part III in our Optimization Deconstruction blog series, The Elements of Experimentation. We will be talking about multivariate testing, personalization, and of course our work with Specialized Bikes! Check out Part I of our series, Foundations of the Industry.